On Wednesday morning, Baltimore City Circuit Court Judge Barry G. Williams heard key arguments from prosecutors and defense attorneys for the Freddie Gray case. The case revolves around death of Freddie Gray, a black man who sustained injuries while in police custody in Baltimore this past April. The hearing has been long awaited by social justice activists, many of whom came out in full force to protest on Wednesday. The events surrounding Gray's death in April, and now the initial hearings regarding the charges facing the six Baltimore police officers charged with Gray's death, have led to high emotions in the city for months as activists call for justice for Gray. The protests on Wednesday brought out a large crowd, and photos of the protest at the Freddie Gray hearing were incredibly moving and demonstrated the powerful sentiments driving the demands for justice. The Guardian reports the crowd of protesters was heard chanting, "Tell the truth and stop the lies — Freddie Gray didn't have to die" while they held signs and gathered in front of the courthouse. During the initial hearing, defense attorneys for the police officers asked Judge Williams to drop all the charges, a request that Williams denied. The defense will also ask the court to allow the trial to be moved outside of Baltimore. As the nation awaits the start of the trial in October, we can expect to see more powerful images like these from social justice activists. Along with denying the defense's request that the charges against the six officers charged with crimes related to Gray's death, Williams also denied a request to remove state attorney Marilyn Mosby from the case. Williams has stated that some of Mosby's comments regarding her empathy with protesters were "troubling," but not enough to warrant her removal from the case. The judge also ruled the six officers would be tried in separate trials. 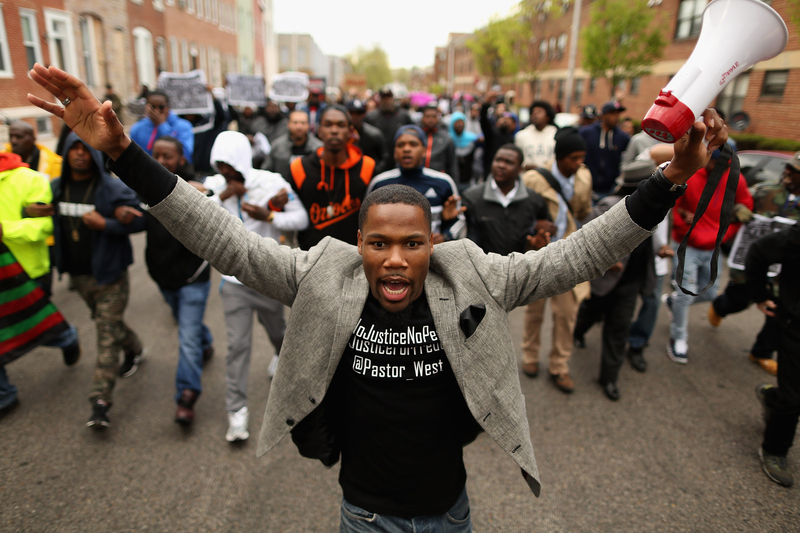 According to The Baltimore Sun, at least one person was arrested during Wednesday's protests. There were also reports of one officer sustaining non-serious injuries while policing the protest. The Guardian further reported the protest had been continuing peacefully, but they were maintaining a presence in the event that the demonstration took a different turn. After Gray's funeral in April, Baltimore saw large scale protests for which there was a heavy police presence for several days.